Three Korean horses who ran in the KRA Trophy at Kranji in Singapore on Sunday touched back down at Incheon Airport this afternoon. The two Busan horses; Gamdonguibada and Nobody Catch Me, will stop off at the quarantine centre at Jangsu Stud & Training Farm in Jeolla Province, while Seoul-based Cheon Gu has gone straight back to the Seoul Racecourse which has its own quarantine facilities. As for the race – the S$250,000 KRA Trophy – the horses did ok. Nobody Catch Me was 6th, Cheon Gu 9th and Gamdonguibada 11th in the twelve-strong event with the pack finishing together. There had been some mildly silly talk in the local racing media here – not exactly discouraged by trainer Kim Young Kwan – about the possibility of one of the Korean horses actually winning the race. However, those of us who were hopeful of a decent performance, but still had nagging fears that they may be left behind in a race that was restricted to Singapore-trained horses with a rating of 90 or lower, were re-assured. As it was, Cheon Gu led out of the gate and into the home-straight before tiring and being passed. 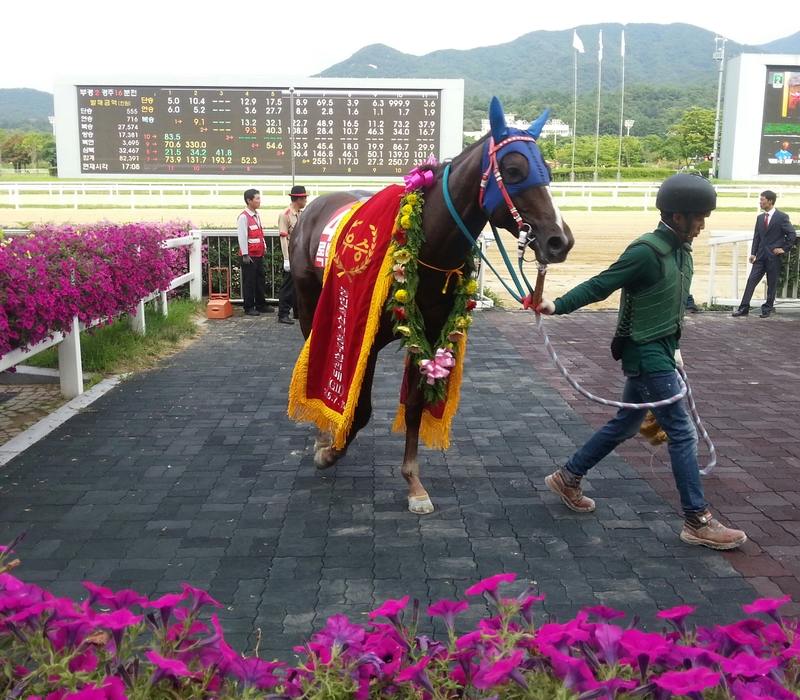 Gamdonguibada, a little predictably for a miler dropping down to six furlongs, took a while to get going and never really fired. However, the pleasant surprise was Nobody Catch Me. Few had given him much chance of beating anything but he finished strongly on the outside to get up to 6th place, just over four lengths behind the winner. That winner was the modestly-named Super Winner (Kaphero). 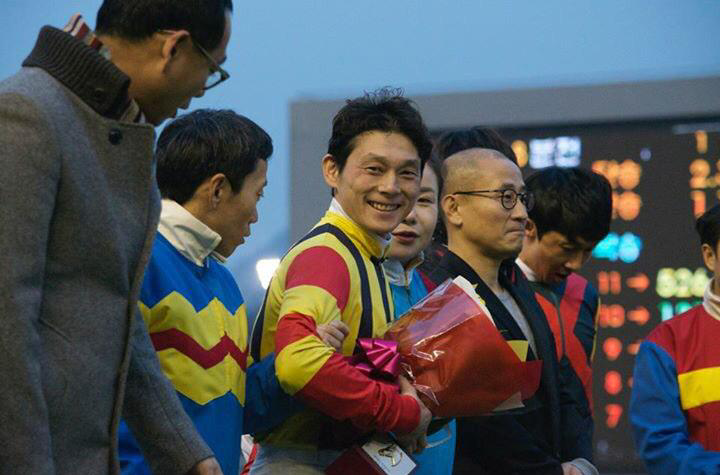 Super Winner’s jockey, Soo Khoon Beng (more often known as KB Soo) has plenty of history with Korea having had a short stint at Busan in 2008 before returning and winning the Seoul International Jockey Challenge in 2012. Manoel Nunes, who also particiapted in that 2012 event, rode My Lucky Strike (Charge Forward), to 2nd place. 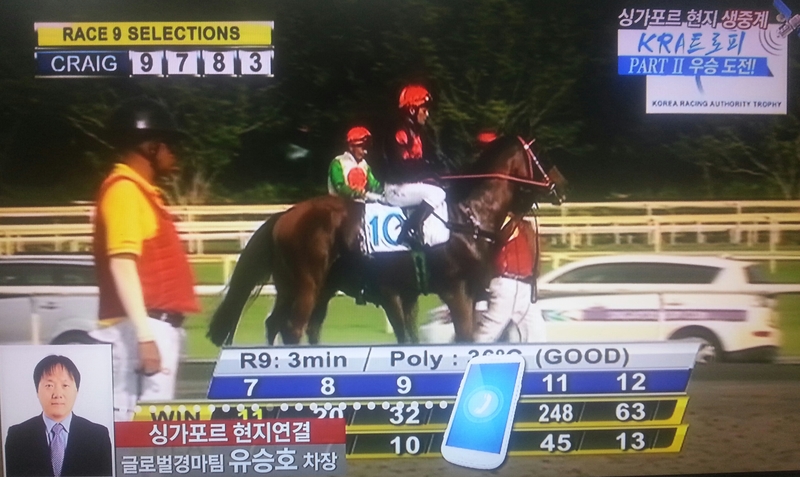 The race was beamed back live to racecourses and OTBs in Korea, the first time for an overseas race. While no betting markets were offered, a good number of the 40,000 crowd at Seoul Racecourse seemed to take an interest. It is to be hoped that those punters will start pushing for an opportunity to watch more overseas racing and for the necessary change in the law to allow legal betting on it. One or two races from places such as Singapore would be an ideal addition to either a Friday card at Busan or a Sunday mixed card. There are many hurdles still to clear before that can become a reality but getting last Sunday’s race onto Korean screens means the first of those has been successfully navigated. The more exposure there is to high quality overseas racing, the better it will be for development here. In some ways the result was a good one in that the horses did well enough to mean there is no reason to feel discouraged or embarrassed. And equally, they didn’t do well enough for anybody here to think the job is anywhere near done and there is no need to improve. The next big event is just a little over a month away in the shape of the Asia Challenge Cup, for which the first nomination stage is this Friday. Nominations are expected from Singapore and Japan while a quarantine protocol has just been concluded in time with the UAE, however, it may be a little too late to get horses racing under that flag this time. The ACC is an invitational race but the KRA Cup Classic, held the same day, is also open to overseas runners this year. Seoul takes centre-stage this weekend as Busan goes off on its summer-holidays. Meanwhile, three Korea-trained horses are in Singapore for Sunday’s KRA Trophy. Seoul flying solo means there is a bumper 15-race-card on Sunday in the capital which rather bizarrely will be followed after racing at 8pm by a pair of motorbike races on the track and K-Pop performances by 4Minute and Hong Jin Young. Which should be…interesting. Also on Sunday, the KRA Trophy at Kranji in Singapore will be beamed back live. No betting markets will be operated in Korea (that’s still illegal) on the 1200M race which Gamdonguibada, Cheon Gu and Nobody Catch Me will take part in. The travelling Korean contingent in Singapore report that Cheon Gu and Gamdonguibada – the two who have the most chance of putting on a decent show – are both well. Several new apprentice jockeys have debuted over the past couple of weeks at both Seoul and Busan with a couple of them catching the eye so far. Meanwhile there are comings and goings among the foreign jockey ranks. Among the apprentices, the stand-out so far has been 18-year-old Lee Yong Ho who has already ridden 5 winners from his first 29 mounts at Busan. 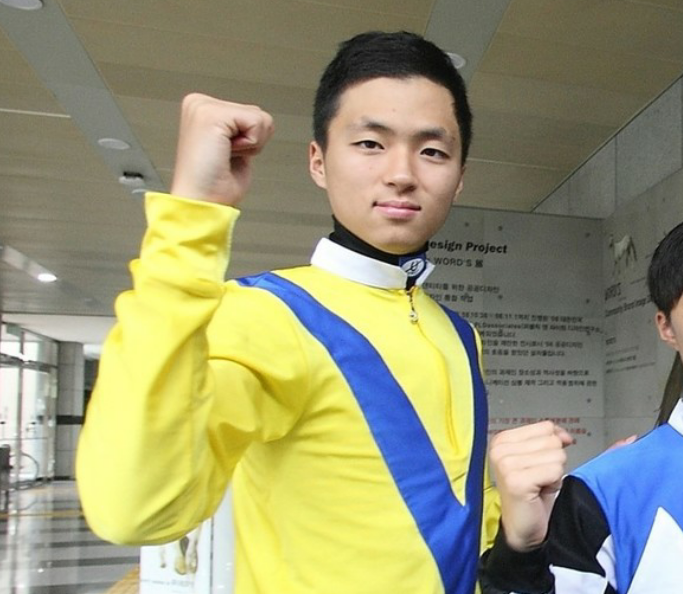 Lee, the youngest jockey to gain a license in Korea for many years, is the younger brother of Seoul rider Lee Chan Ho, who made a similarly impressive start to his career two years ago. The younger Lee had already built quite a reputation for himself before his debut and he has received support from trainers right from his first day. At Seoul, the best so far has been another Lee; Lee Hyeon Jong. After several near misses the 21-year-old rode his first winner last Saturday and quickly followed up with another. He has only had 13 rides so far but 7 of them have finished in the placings. Among the other new apprentices, Park Jae I and Jin Kyum, both at Busan, have managed to get 2nd places while Kim Do Jung at Seoul has a 3rd to his name. 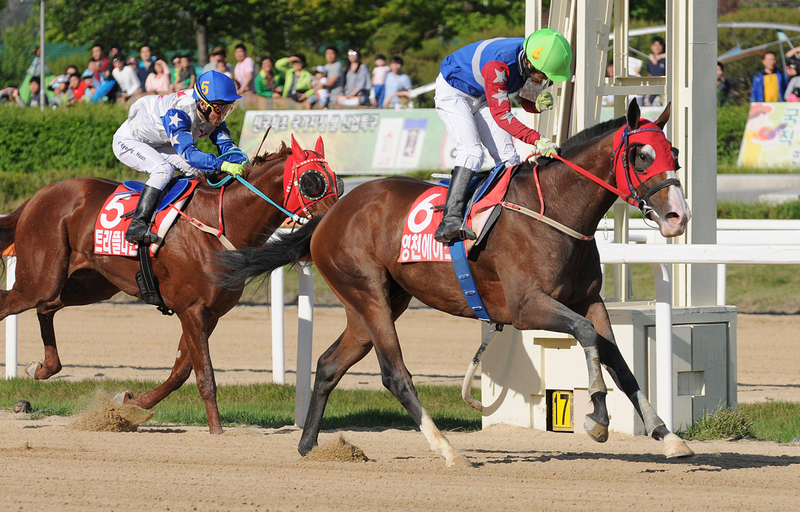 Debuting at Seoul last Saturday was Japanese jockey Yuri Takahashi. The 28-year-old, who is affiliated with the Iwate Racing Association, endured a challenging opening weekend with seven rides, none of which had a chance. Hopefully things will get better for him in future weeks in the way they’ve certainly got better for Djordje Perovic. The “Serbian Frankie” rode his 14th Korean winner on Saturday and if he continues riding the way he has been, he looks set to be the first non-Japanese visiting jockey to make a real impact at the notoriously difficult Seoul. The other foreign rider at Seoul, Jarred Samuel, who has been a popular and positive presence for the past four months, has opted not to renew his contract and will return to South Africa at the end of July. Samuel will be replaced and another foreign rider is expected to arrive at the end of August. Down at Busan meanwhile, Ikuyasu Kurakane is set for his third Korean stint, having been granted a license once more. Kurakane won the “MVP Award” at Seoul Racecourse last year – an achievemnet that led to the Japanese NAR presenting him with a special prize at their annual “Grand Prix” awards ceremony in February. Elsewhere, former Busan jockey Joe Fujii is now riding in Hokkaido and landed his first Japanese winner at Mombetsu Racecourse last week. 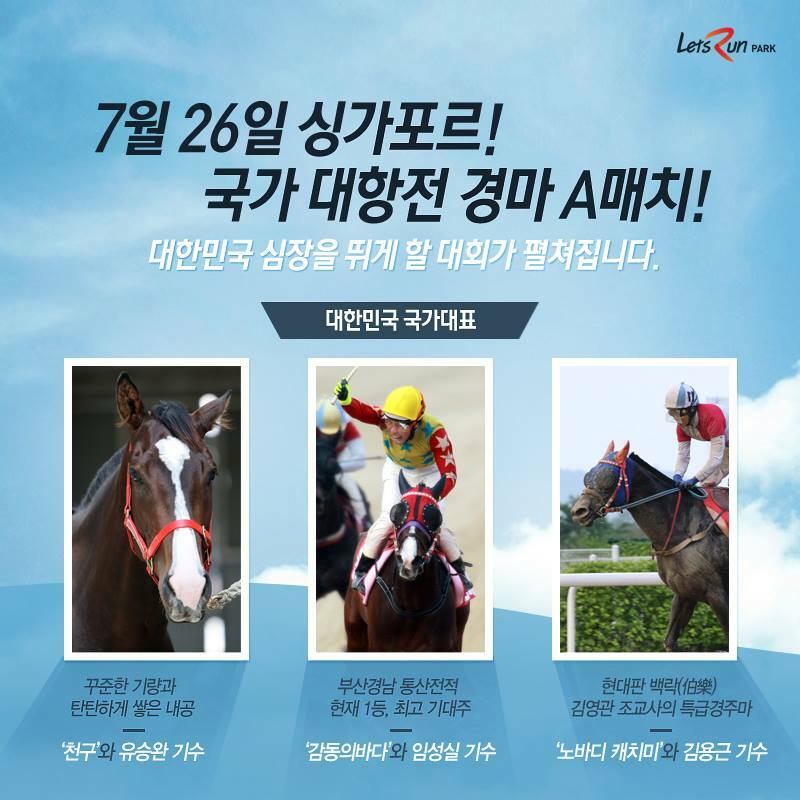 The era of foreign ownership of racehorses hits Seoul on Saturday. Race 1 sees Alexandra, owned by Arthur Inglis, making her debut in race 1. 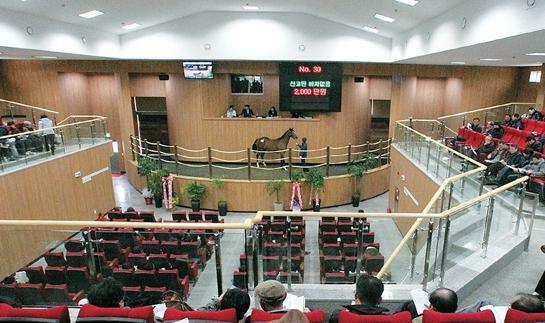 Inglis purchased Alexandra (Hawk Wing) for KRW 15 Million at the Jeju 2-year-old sale in May. Hopes are not exactly sky-high yet as she scraped through her barrier trial just within the qualifying time. Kim Hye Sun will ride. A number of other 2-year-olds belonging to the newly licensed foreign owners are expected to debut in the next few weeks. That’s the first race of two days at Seoul which culminate on Sunday afternoon with the Minister’s Cup, the final leg of the 2015 Triple Crown. We’ll have a full runner-by-runner preview of the big race shortly.